One of the things that impressed me during my week-long course in Singapore was that floating liquified natural gas (FLNG) concept is becoming a reality. Shell has signed a contract with a consortium with Technip and Samsung to built such facility, which will eventually be used for the Prelude LNG project in Australia. Floating LNG concept has been thought about for a very long time and many international oil companies (IOCs) toyed with the idea. It is ideal to be used for stranded pockets of gas, where laying pipelines to an onshore LNG plant might not be feasible. FLNG vessel may be moved from one gas well to another, hence providing the flexibility of developing these gas wells, which may not been possible if the concept is not realised. 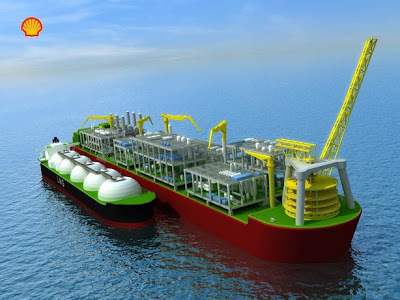 The FLNG vessel that Shell has contracted Technip and Samsung to build will have a dimension of 450 metres by 70 metres, making it one of the biggest sea vessels to be built. It will have a capacity of 3.5 million tonnes per annum of LNG, with additional capacity to process condensate and LPG (liquid petroleum gas). The vessel will have the capabilities to store LNG, condensate and LPG. An LNG tanker will berth alongside it for loading. At the moment, no financial details have been made available. It is open to anyone's guess how much it would eventually cost. Here's an artist impression of the FLNG vessel. The LNG tanker that berths alongside it is a 140,000 cubic metre A-class tanker, so you could probably imagine how big the FLNG vessel is. That will be one huge floater! Also, below is a video on the floating LNG concept.